In the past couple of weeks, we have seen a lot of leaks and rumors related to the Nokia 9 and Nokia 7.1 Plus. We aren’t sure if the Nokia 9 is coming with a Penta Lens or not but it is almost confirmed that soon, Nokia will be launching 7.1 Plus. Recently, the press renders of the 7.1 Plus were leaked by MySmartPrice, revealing the design of the phone. 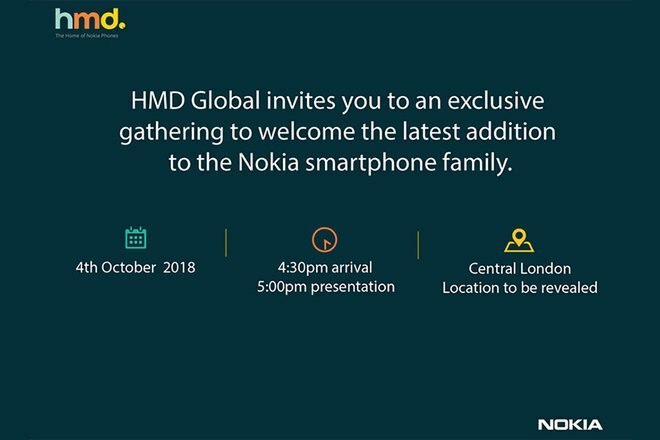 Now, HMD Global is sending out invites to a launch event that is happening on October 4. At the event, a new Nokia smartphone will be launched. The invite says – “HMD Global invites you to an exclusive gathering to welcome the latest addition to the Nokia, smartphone family.” Most probably, we will see the launch of Nokia 7.1 Plus, which is expected to launch with Snapdragon 710 processor, a huge upgrade from the Snapdragon 660 processor that powers the Nokia 7 Plus. There is a 19:9 notched display like the Nokia 6.1 Plus, metal and glass build, USB Type-C port, a huge chin and more. There are very few chances that Nokia 9 will be launched at the event but the Google Pixel 3 devices are launching on October 9, so this is a good chance for Nokia to grab the limelight by launching its flagship just a few days before the launch of Pixel devices.